This is a collection of robust and intensely flavorful dishes to prepare when you want to pull out all the stops and impress your dinner guests. 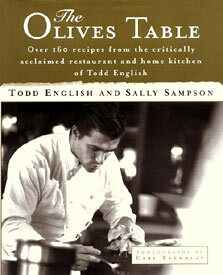 There are about 200 dishes in this popular volume from Todd English, owner of the Boston restaurant, Olives. Some tantalizing choices include Todd’s signature Olives Tart, baked in a crisp crust and rich with olives and creamy goat cheese, Tuscan-style Rabbit Lasagne, Ginger Mustard Chicken, Asparagus Risotto with Ragu of Crazy Porcini Cream, and Chocolate Risotto. Not for the faint of heart, the dishes in The Olives Table require a little extra time, effort and ingenuity, but his careful, step-by-step instructions and perfect results make it a journey worth taking. The images help to get it right too. English describes his food as “refined rustic”—or as we prefer—“Mediterranean with muscle”. Coupled with the Olives Dessert Table, you’re fully equipped to come up with some serious, jaw-dropping dinners!